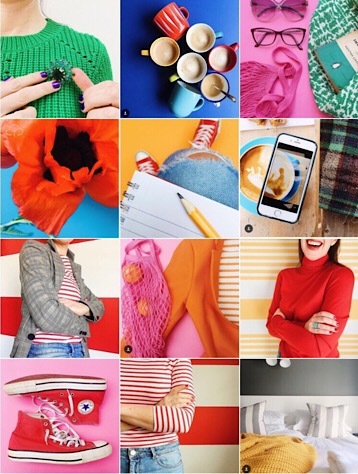 I know that there are different schools of thought when it comes to curated matchy-matchy Instagram feeds vs free form post-whatever-you-damn-well-like ones. I might as well lay my cards on the table, I think that if you are trying to build a strong brand on (or off) Instagram (as I am) then it makes sense if your grid….makes sense. We don’t have long to engage people’s interest when they first visit our account. Just milliseconds to say what we are all about. 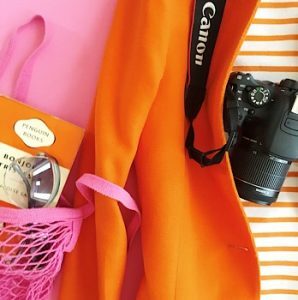 Each of us is quite literally one in a billion Instagram users, and an obvious way to stand out is with a consistent photographic style and colour palette. I also just think it looks nice, which is a good enough reason for me. I feel like my truly harmonious grid is on the tip of my tongue, just a hair’s breath out of reach. So I’ve been doing a bit of work recently on trying to nail it down, and have come across a couple of little exercises that I would like to share. I learnt this game at a workshop given by Instagram superstar Dominque Davis @allthatisshe (if you aren’t aware of her clever, clever pictures I recommend you click on her username to check them out). Do you wonder why some of your pictures don’t really work and leave you feeling a bit meh, but can’t really figure out why? 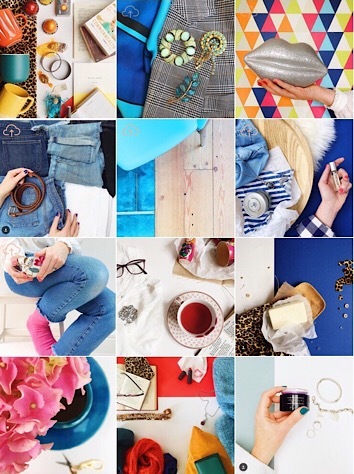 Can you imagine an Instagram grid where you loved every picture and it was all your very best work? Let’s make it happen. To join in, first you will need to download a grid preview app such as Preview or Unum. Go through your Instagram account and chose 9 or 12 of your least favourite images, the ones that make you cringe a bit, or just seem to stick out as a bad fit in your feed. Load them all up in to your preview app, and see how it looks. This is mine. I think that what they all have in common is that they are fussy and the colours are cold. No more! You’ve guessed it, now do the same with 9 or 12 of your best images. Here is my best grid. No surprise I suppose that the images all sit together well, and have similar colours and composition. This is so helpful in clarifying what I should be trying to go for with all of my pictures, I love my Best Grid. If you are at the beginning of your Instagram career like me, I’ve posted some of my thoughts on growing you account from 1,00-2,500 followers, click if you are interested to know what I have learnt. Another cool little tool that you could try if you would like to make your work more consistent and easily recognisable is ColorKuler. Just type in your Instagram username (without the @) and the app will generate your true palette, based on what you have posted so far. If the theory holds true that we are drawn to and post the colours that we like, then there will be a hidden pattern in your posting habits. Click HERE to have a go. 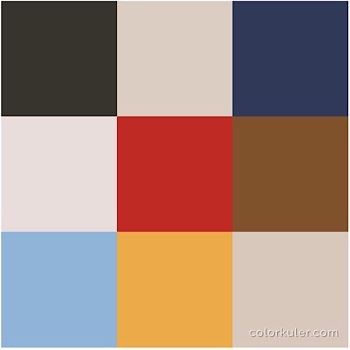 This is my palette. My results were NOT as I was expecting, and revealed that I have been bringing other colours in to my pictures, perhaps without realising it (browns!?). I’m going to try and use this to make some adjustments to my photographs, and then check back in with ColorKuler again in a few weeks. Let me know how you get on if you try either of these out, I’d love to know whether you find it useful. Read some iPhone photography tips HERE or if you would like to find out more about my new baby Not About The Kids then click to read my first ever blog post. Hey Karen, thanks for visiting the blog (it makes me so happy!). Thank you, I think I should clarify and say that they are only my least favourite because the didn’t seem to work within my feed, so I would look at them and think, urgh. Having said that I really don’t like the one with my arm in, it looks like I have passed out drunk in the middle of the day!! !